3 LED Dynamo Hand Crank Flashlight Squeeze Light - This emergency flashlight offers a built-in squeeze dynamo to power the flashlight. Just squeeze the dynamo like a hand-crank on the sides to charge up the power of the battery. The long lasting LEDs will last for up to 50,000 hours. The 3-LED bulbs are ultra-white and are remarkably bright. 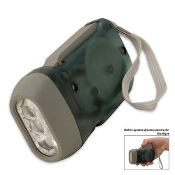 It's great for camping, automotive, camping, boating and emergencies. Includes nylon lanyard.